For the first time in Highland GPs working in the area now have access to mentor support to help promote staff health and wellbeing. NHS Highland's Mentoring Scheme, which saw the first trained mentors graduate in 2016, was recently extended to include GPs as trained mentors and a group of 10 mentors were successful in graduating last month (February). The University of the Highlands and Islands has welcomed its first cohort of students onto an innovative new midwifery course. 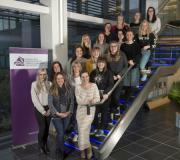 Nineteen students gathered at the Centre for Health Science in Inverness on Monday 7 January 2019 to begin the shortened midwifery programme. NHS Highland has created a handy list of telephone numbers to help improve access to healthcare services in Caithness - including a single point of contact number for community health and social care. The information is given on a laminated double-sided A4 flyer with timely advice about the health board's services and the relevant telephone numbers for these and associated services. NHS Highland has agreed that the Caithness General Hospital will be heated by energy delivered by the wood fuelled district heating scheme in Wick. Supply of low cost renewable energy will begin immediately. Voters in the three Highland constituencies for the UK Parliamentary General Election of: Caithness, Sutherland and Easter Ross; Ross, Skye and Lochaber; and Inverness, Nairn, Badenoch and Strathspey are being reminded by Returning Officer Steve Barron that their vote matters. Tomorrow (Thursday 7 May) voting begins with 283 polling stations opening their doors at 7am and remaining open for voters until 10pm. A ward at Caithness General Hospital has been closed to new admissions and visitors are being asked to stay away while staff deal with several cases of diarrhoea and vomiting. Bignold Wing currently has seven patients affected and samples have shown that norovirus is present in the ward. Statement From NHS Education Scotland (NES) NES quality management visit, Caithness General Hospital. NHS Education Scotland (NES) is accountable to the General Medical Council (GMC) for assessing whether doctors in training are in an appropriate training environment. We carried out a quality management visit to Caithness General Hospital on Friday 13rd February to assess the quality of the learning experience and learning environment for postgraduate medical trainees in line with General Medical Council Standards. The visit was prompted by a shortage of substantive consultants in post and continued heavy reliance on locums and therefore the potential impact on the quality of training and supervision of doctors in training. Don't lose your vote poster With the European Parliamentary Elections taking place on Thursday 22 May, Bill Gillies, Electoral Registration Officer for the Highland and Western Isles area is urging voters to make sure they are registered to vote in time. “People are talking about the elections, but you’ll only be able to have your say on who represents you in the European Parliament if you’re registered to vote by the deadline of Tuesday 6 May and for postal applications by 7 May”, said Mr Gillies. Users of the A9 will welcome the news that a preferred option has been chosen for the challenging hairpin bend at Berriedale Braes on the northernmost part of Scotland’s longest trunk road. A public exhibition is being held today at Berriedale (2nd April 2014) to give people the opportunity to view the proposals and provide their comments.